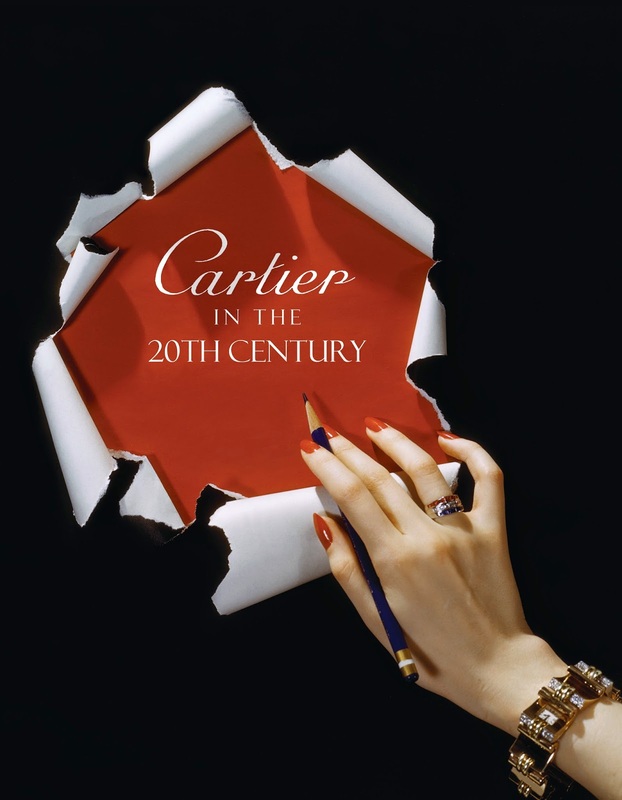 Cartier in the 20th Century is being published in association with the Denver Art Museum to coincide with an exclusive exhibition, "Brilliant: Cartier in the 20th Century." 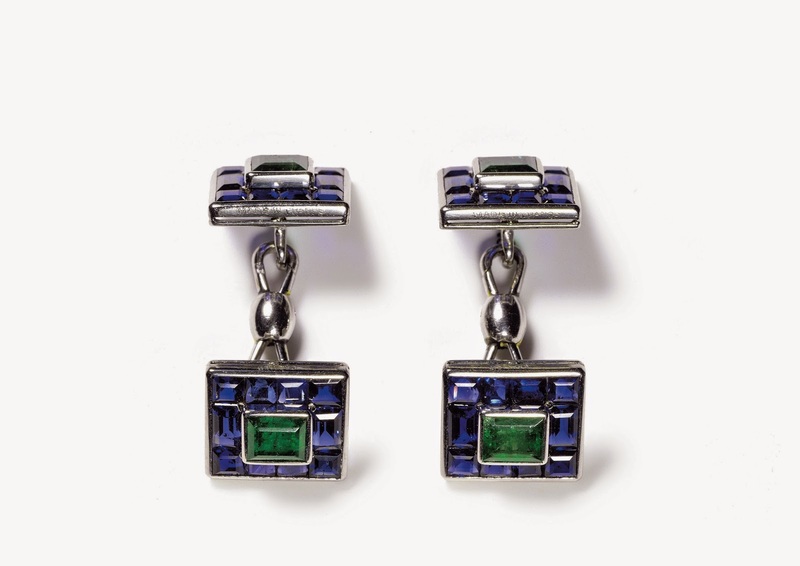 On view from November 16, 2014- March 15, 2015, the exhibition features 250 objects, including equisite fine jewelry, timepieces, men's accessories and more. 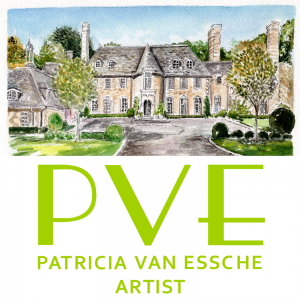 A must see collection on exhibit! Cartier Collection. Cartier London. Photo credit: Nick Welsh. Special order for Lady Beatrice Granard, 1932. 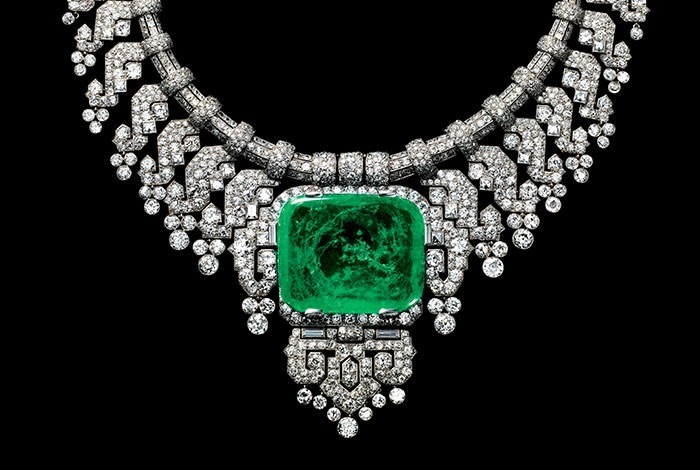 Platinum, round rose and old-cut diamonds, polished, cushion shaped 143.23 carat emerald. 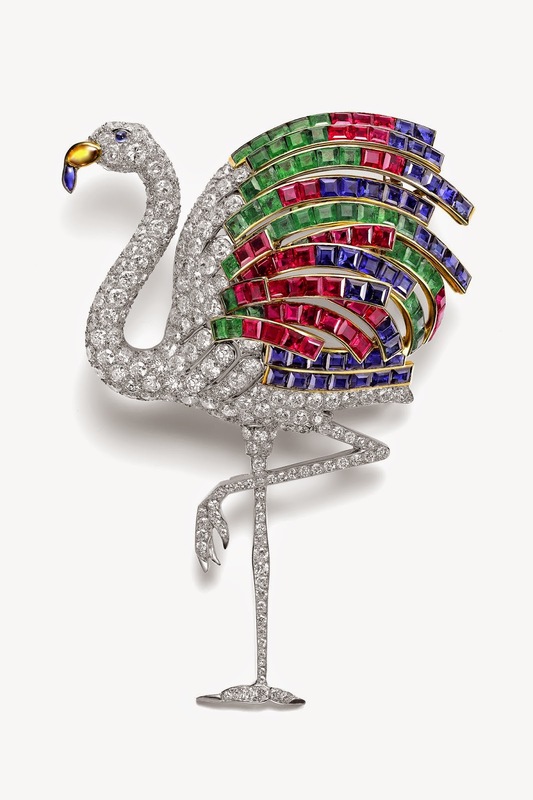 Cartier in the 20th Century is filled with 300 color and black and white photographs as well as many images showing royalty and celebrities wearing exquisitely refined Cartier jewels. Hindu Necklace. Cartier, Paris, Special order, 1936, altered in 1963. Made for Daisy Fellowes, heiress to the Singer sewing machine fortune and daughter of a French Duke. 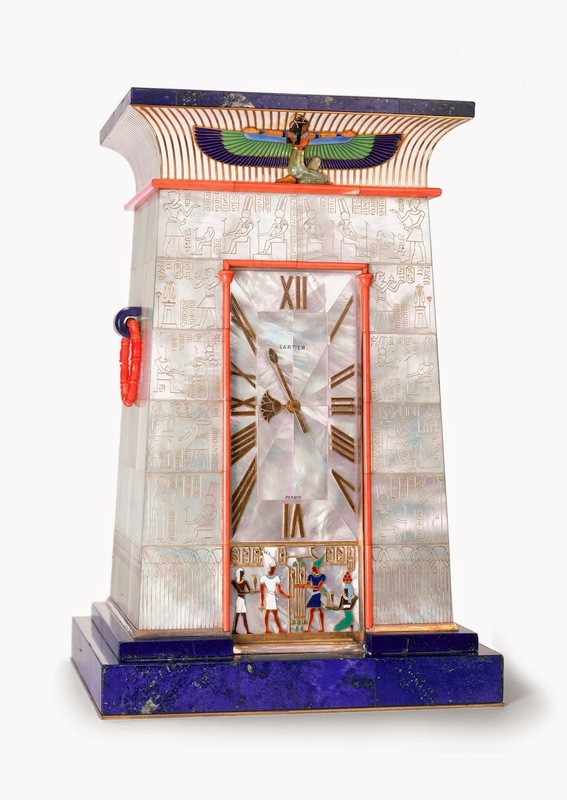 Egyptian Striking Clock. Cartier Paris, 1927. Stomacher Brooch. Special order, Cartier Paris, 1907. 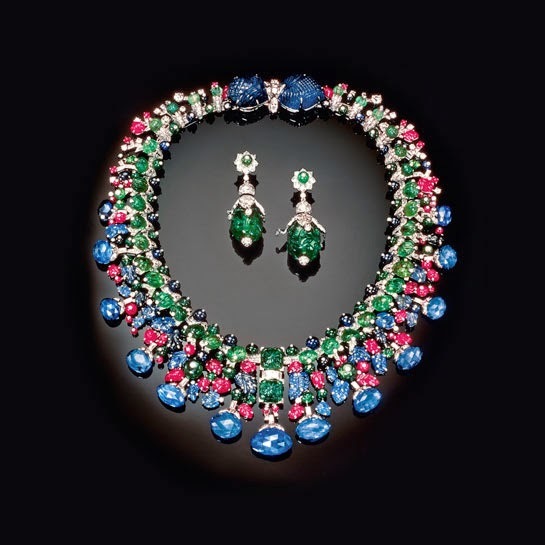 Platinum, sapphires, round old and rose-cut diamonds. Cuff Links. Cartier Paris, 1929. 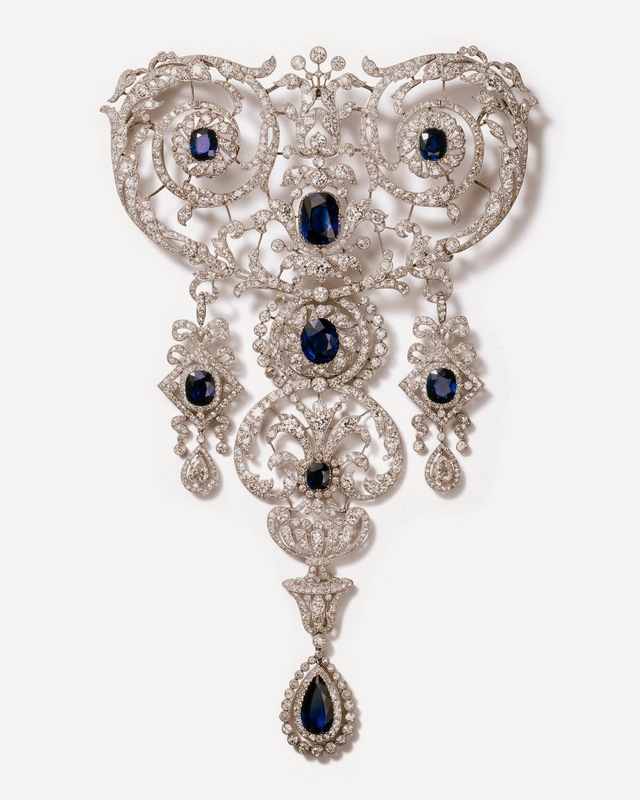 The Duke and Duchess supplied many of the stones used in this brooch. The Vendome Press has provided me with the publicity copy of this fine book. 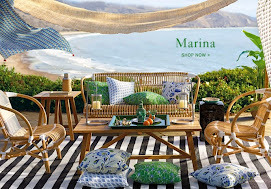 These are all gorgeous designs, Karena! I'd love to have known the stages of producing that Persian cigarette case — I've never seen gold etched or engraved quite like that. Gorgeous post, Karena. One of my most treasured possessions is a Cartier tank watch. Have a wonderful week. 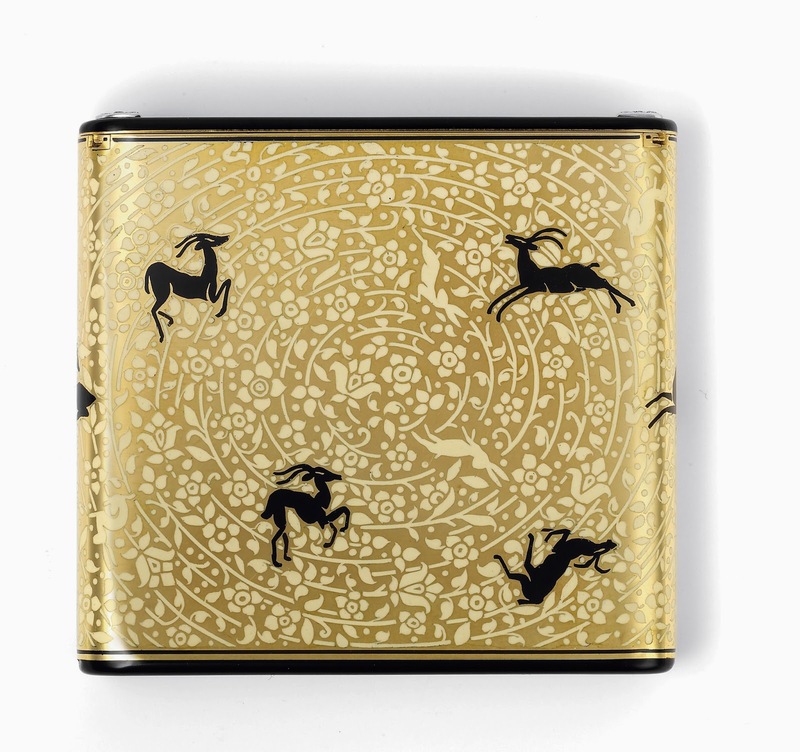 Mark, there are pages devoted to equisite cigarette cases, cigarette holders , lighters etc, from the era of when smoking was "so fashionable"
I have seen MOST of these pieces in person!A few years back in San Francisco CARTIER had an exhibit. The STOMACHER spoke to me!CAN YOU IMAGINE wearing such a piece?! 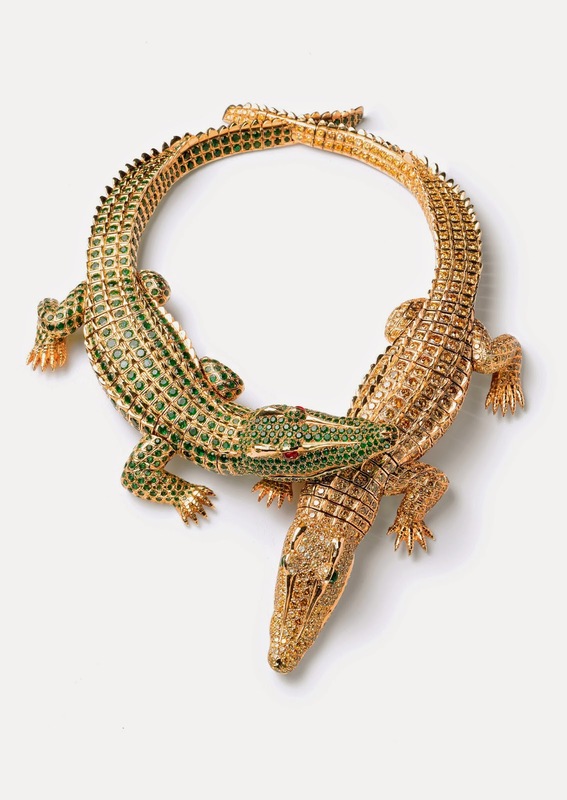 !I was recently in PARIS and CARTIER had a booth at an antique show I attend.......the jewels wereNOT to be believed!Do you ever think jewels and DRESSING will come back into fashion?I sure hope so! PS.The soiree was BEAUTIFUL......working on photos now to share with YOU! Simply stunning. All of it. That Crocodile neck piece is amazing! The cigarette case is beautiful! can you imagine the opulence? Love the flamingo! Cartier is SO beautiful, I wish I could own some-one day! 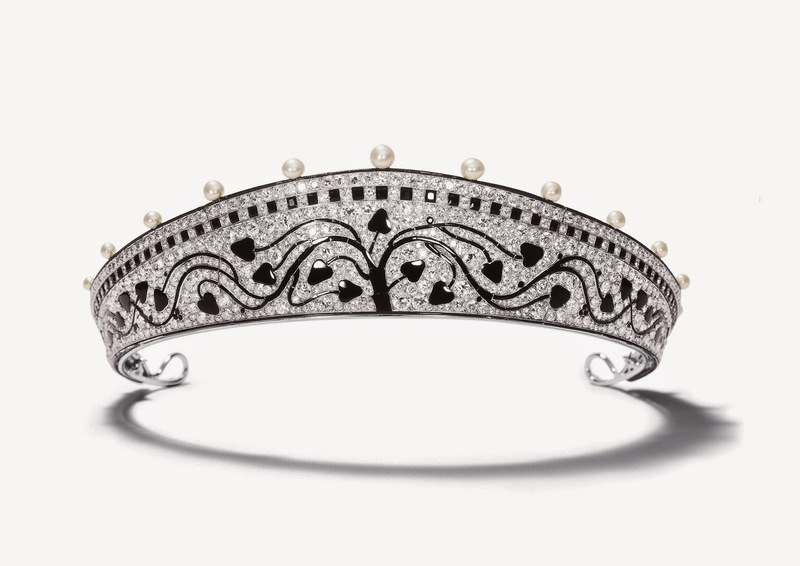 The tiara is my favorite. Gorgeous book, Karina. Those gems are absolute works of art. I could stare at them for days. Lovely! Cartier is my favorite! Thanks for the delicious images! You are always so nice to coment on my blog! Do me a favor and like me on facebook! Like Jeanne said, I could look at this books for days. You so nicely present all these exquisite pieces. Can I only have one?